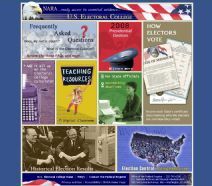 This website about the United States Electoral College from the National Archives is an excellent resource for both students and teachers. It is divided into sections that include: answers to frequently asked questions about the Electoral College; historical election results, state by state electoral information, and an Electoral College calculator for younger students. Also included is an entire section devoted solely to teaching resources.